Florida’s labyrinths | Florida Hikes! His wife Catherine gave him two tons of rocks for his birthday. Not your typical present! But John Paalvast knew just what to do with them – build a labyrinth. The Paalvast family labyrinth journey began a few years earlier out West. A hotel brochure of things to do nearby included a labyrinth. It was their first. More followed in different places and soon they were seeking them out. After moving to Spring Hill John traveled some distances to walk labyrinths in Tampa and elsewhere. Then the couple bought the empty lot next door. Why get in the car and go far away to walk a labyrinth? Why not build one here at home? John became both the designer and builder of a seven-circuit labyrinth sitting in a woodland setting. This labyrinth has lovely sweeping turns, a pathway strewn with fallen leaves and an organic design that respects the trees already growing there. My favorites were the saplings standing tall on either side of the path, like sentinels keeping watch over the path’s energy. Those two tons of rocks, his birthday present, outline the labyrinth path. Spring Hill is located north of Tampa. Like all private gardens an appointment is necessarily to walk their labyrinth. Contact them by E-mail for availability. 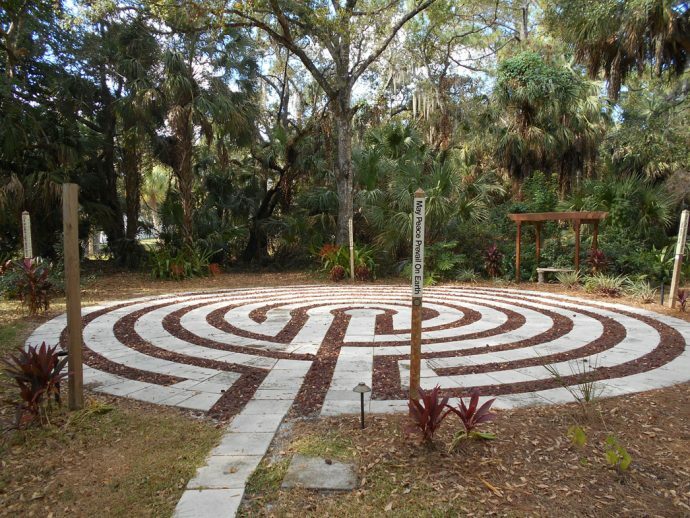 I was surprised to learn Florida has an estimated 132 permanent, mostly outdoor labyrinths scattered around the state waiting to be walked – from a neighborhood park in Pensacola in the Panhandle to a labyrinth on church grounds on Plantation Key in the Florida Keys. A maze is a puzzle to be solved. A labyrinth is a winding path moving in and out towards a center. There are no dead ends. Labyrinths have been around all over the world for at least 3,500 years and used as a tool to meditate, enhance creativity, deal with grief and stress – like exams. Faculty with the Spiritual Life Project at Florida State University in Tallahassee hoped the jazzy Facebook blog headline “Stressed out by finals? Come walk our labyrinth” would attract students to FSU’s canvas labyrinth put down on a classroom floor. It worked. In fact walking the way has became so popular that a permanent outdoor labyrinth is under construction on the FSU campus. A labyrinth path is a metaphor for life’s journey. How to walk one? Stand at the beginning (the open path) and take a few deep breathes. Be still. Some like to carry a question in with them. Others just let go of expectations. It is your journey. A 7-circuit outdoor labyrinth behind Unity of Sarasota. Photo by Lucy Tobias. Arriving at the center, reflect and be grateful. Notice any changes in yourself and your relation to this time and place? Begin the journey outward. Every labyrinth walk is different because you are different. 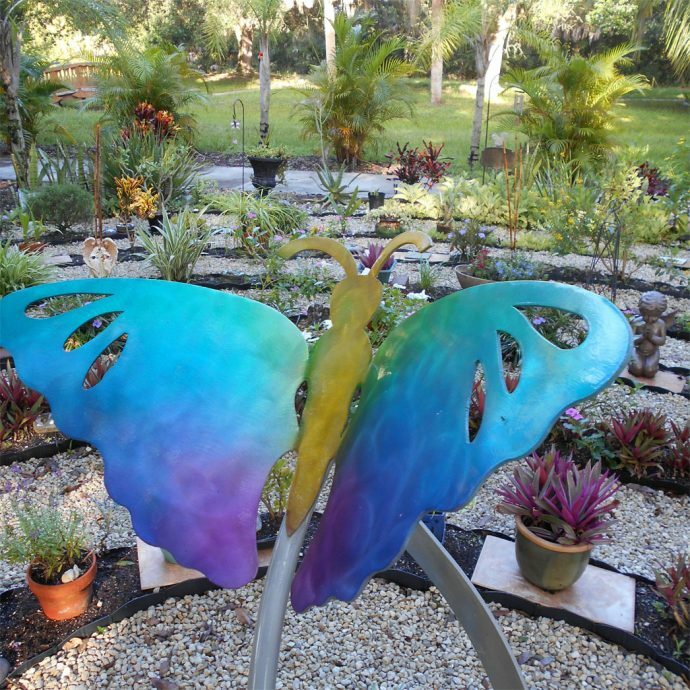 I am walking all labyrinths I can find in Florida and creating a labyrinth trail for a book plus there are chapters on children circling the center, making a labyrinth and more. Publication date: September 1, 2018. Come walk with me. Rev. Dan – your labyrinth at Unity is in my book! 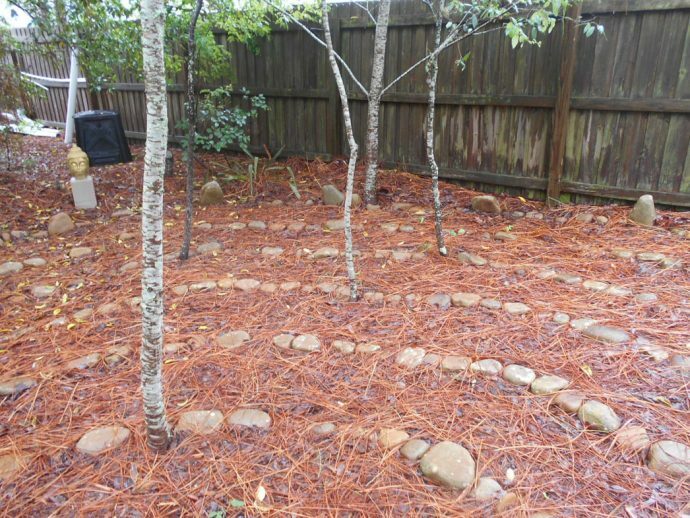 What a terrific idea – building a Labyrinth! You have really given me the bug. My husband can build anything, so this may be our next project! Love your pictures!